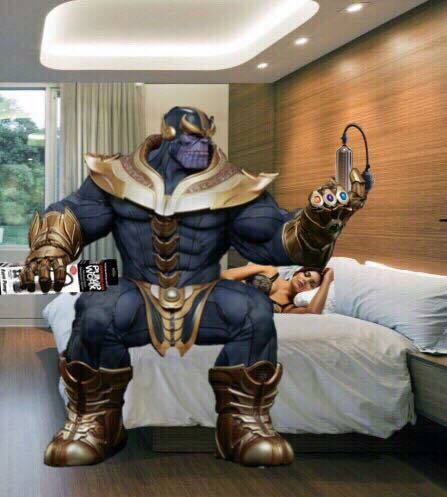 "Thanos will come with 2 comfortable fluffy pillows, a blanket painted in unreal infinity colors and the first 10 lucky customers will also get an exclusive Adam Warlock Bedside Lamp!" Damn, i hope they get all the likes back on the new page. the following is very important and serious to us. We make it clear and and are honest with you. After a inconsistency with our Social Media Manager our ways are now separated. The whole situation now effects first our Facebook page and second the Homepage where you ordered from in the past. All our other channels are not effected and you will find the same news very soon on our new Facebook page which we are creating at the moment. During the past few months we saw this coming and therefore worked in the meantime on our new Facebook page in order of not getting you disappointed. At the same time we are building a complete new Homepage which should go online hopefully in the end of May. If you have any questions please feel free to write or contact us via Office@merchandise-szepan.de . We are here for you! Please don´t use the old Facebook page and dislike it. There will be no other way from now on. 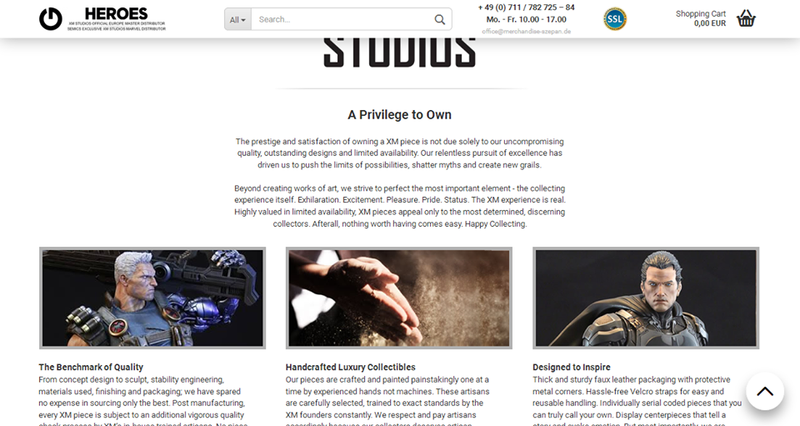 The old team is not allowed to use any content and in case they did XM Studios Premium Collectibles would be informed about it. We wish you all a nice weekend! 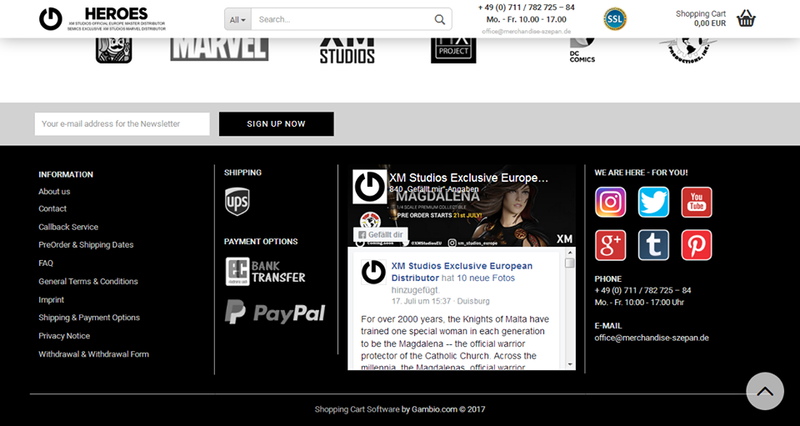 our EU Distributor has brought to our attention the NEW and OFFICIAL facebook for XM EU is now at XM Studios Exclusive European Distributor please note that this is the OFFICIAL EU FB. 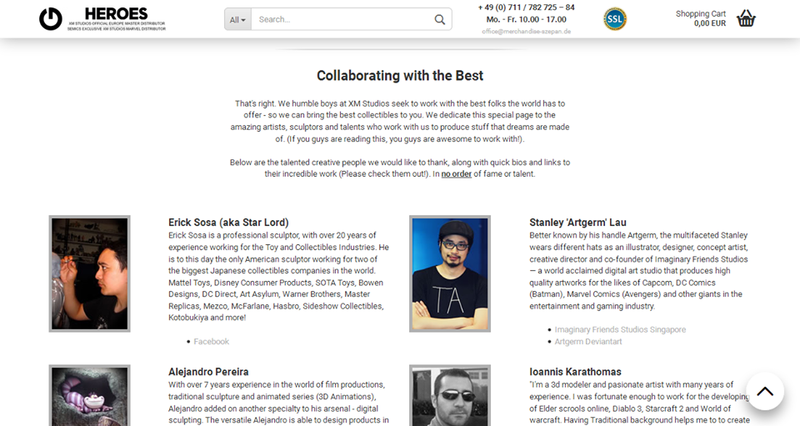 The old EU FB is no longer endorsed by XM Studios, Bryan Tan." "Awesome morning today in singapore! 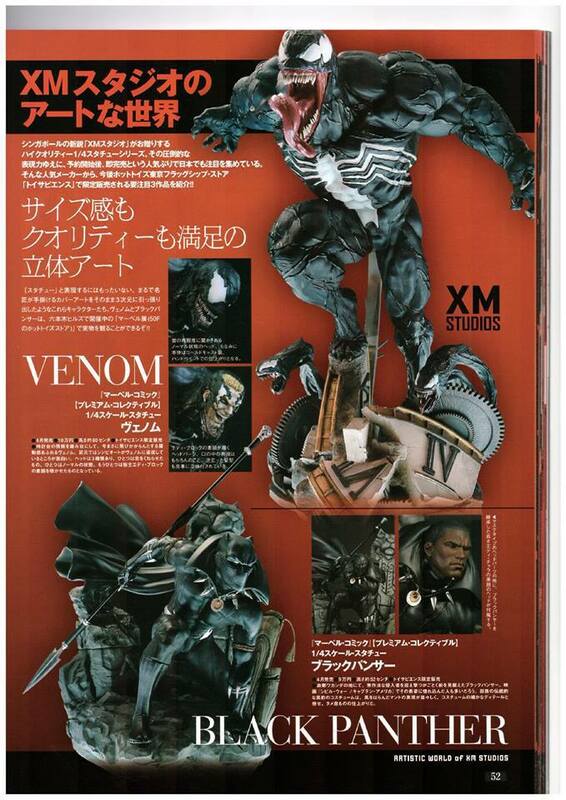 Our uber cool friends over at Hot Toys Japan sent over some Figure King magazines and it was surreal seeing our work featured in Japanese! SUGOI! 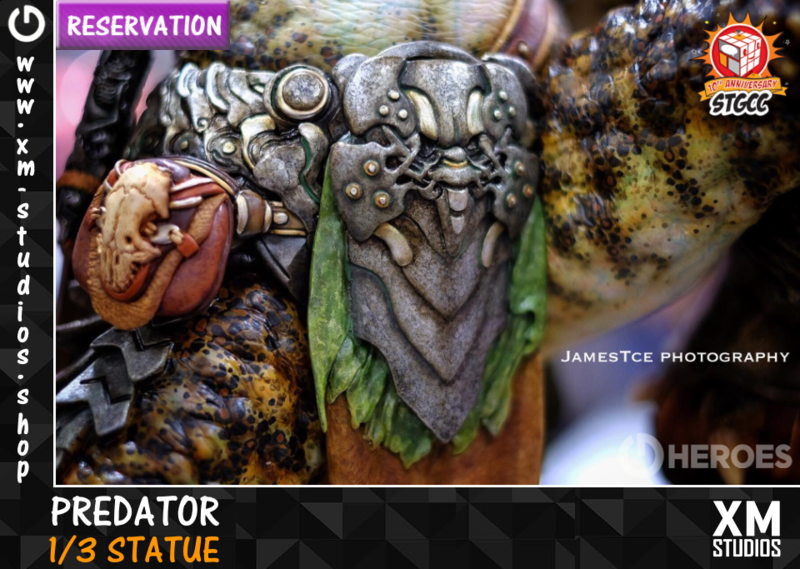 Thank you to the amazing team at Hot Toys for the pleasant surprise!" "Take Part in the XM Mood Photography Contest! What is the difference between a good photograph and an excellent one? First of all, an excellent photo is the one, which conveys not only the visual image, but the emotional environment as well. When a picture shows the emotion, it usually refers to mood photography. Anyone can take a ‘product photo’ but the real challenge is to make it into an Art of communicating with the audience through visual imagery. 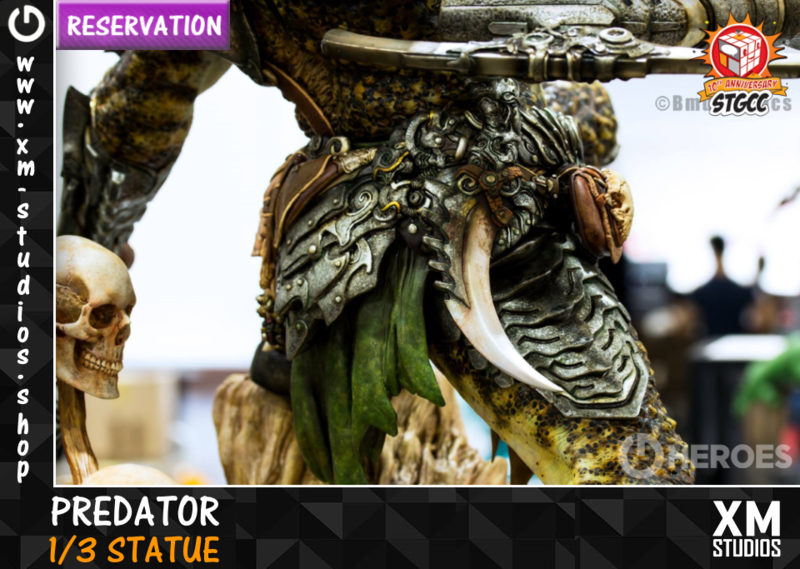 Time to get your cameras out, creative juices flowing and share some mood photography of your favorite XM Statues! 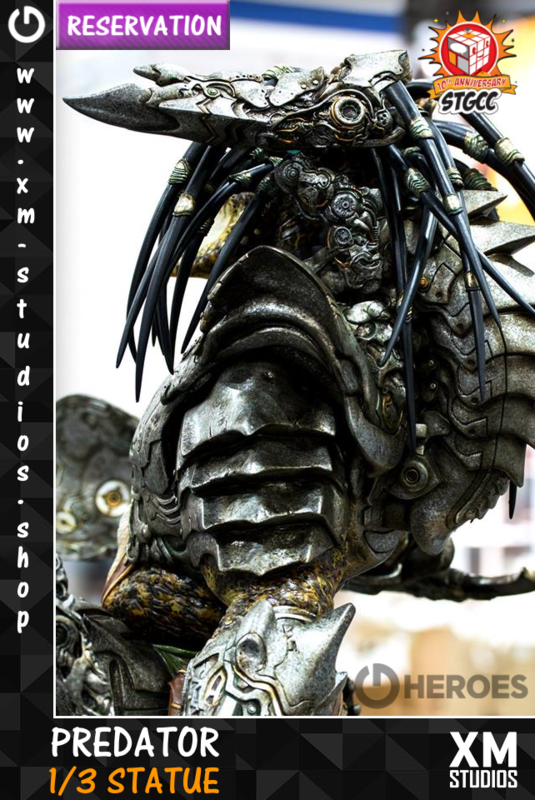 For more information, head over to our page at XM Studios Photo Contest. Thank you an have fun!" today we are proud to present you our new homepage. 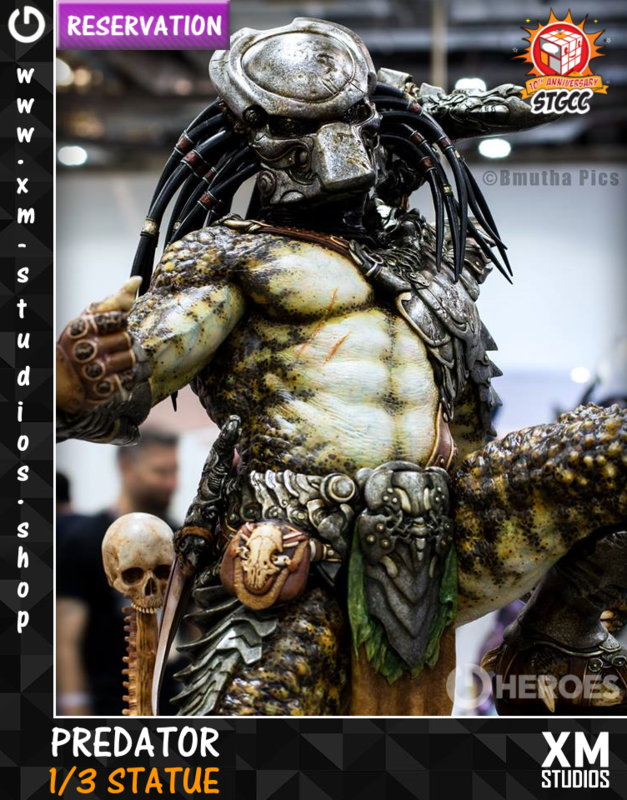 As the "XM Studios Official Europe Master Distributor" from XM Studios Premium Collectibles we at GHEROES working hard to reach our friends in singapore. It´s a long way, but we can do it with you. 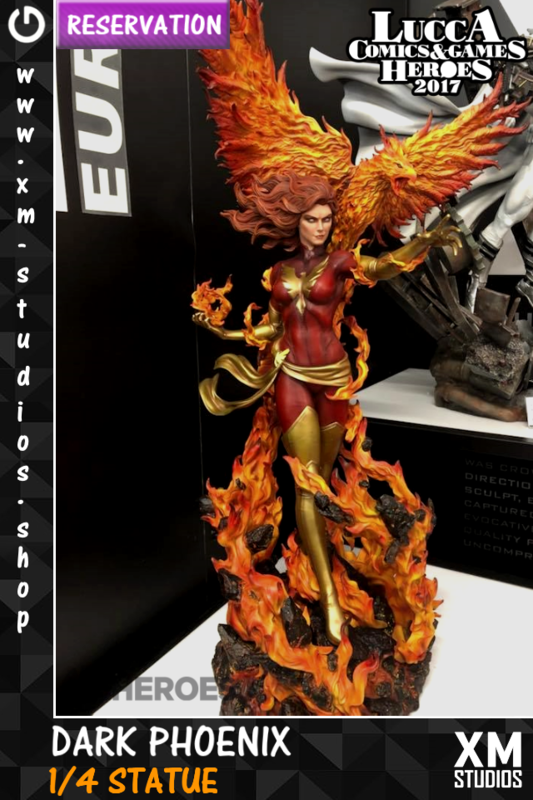 After a few more information specially on the Pre-Order from XM Magdalena you can visit the new shop under www.xmstudios.shop. The shop is available on English and German, choose your language. If you have a question please write a comment or contact us under Office@merchandise-szepan.de. We are here for you! Please note! You must re-register your account. The old accounts are gone with the old page. We are sorry for that. 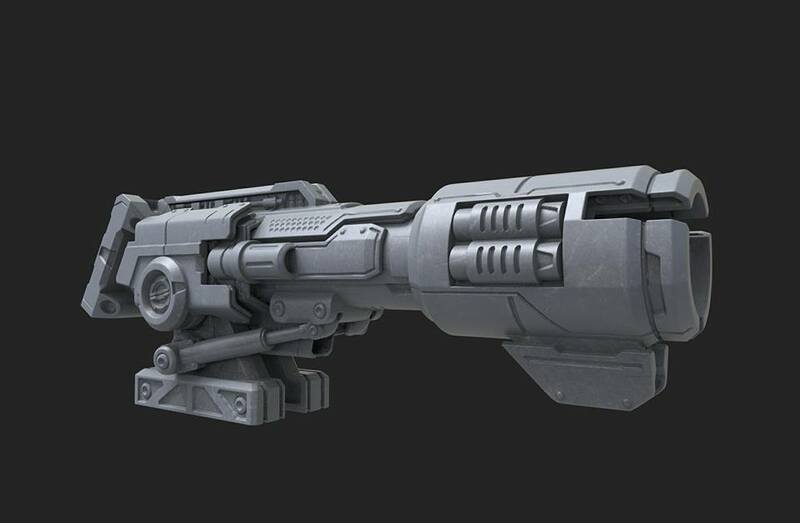 This will be our first Pre-Order on the new page. The Pre-Order starts tomorrow 21st July and goes completely online at 19:00 (German time zone). If you want this beautiful piece, please register before on the new page. XM Magdalena will be retailing at €1099 with an MTO edition size. Safe your Pre-Order. 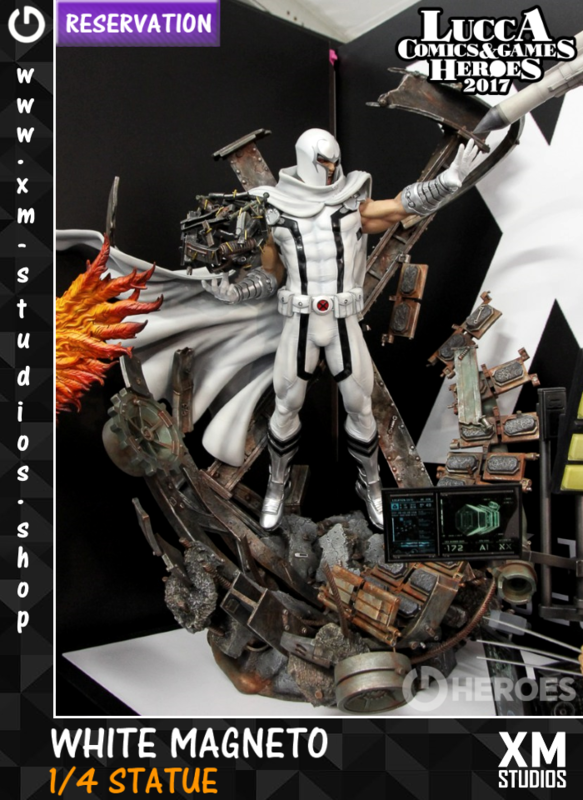 "XM is delighted to announce our upcoming line of DC's Justice League 1/6 scale collectibles! 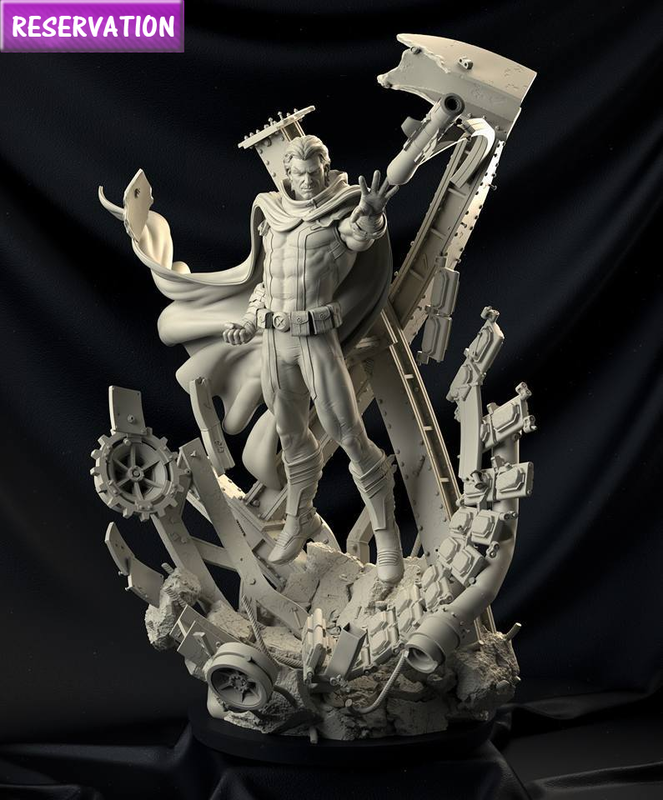 And just like our Batman Samurai 1/4 series, this line will be available worldwide! 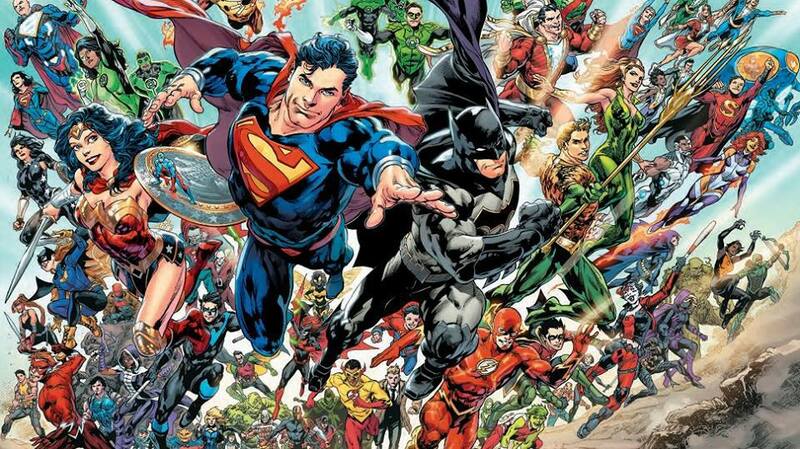 Join us on this amazing journey as we explore the vast universe of characters! 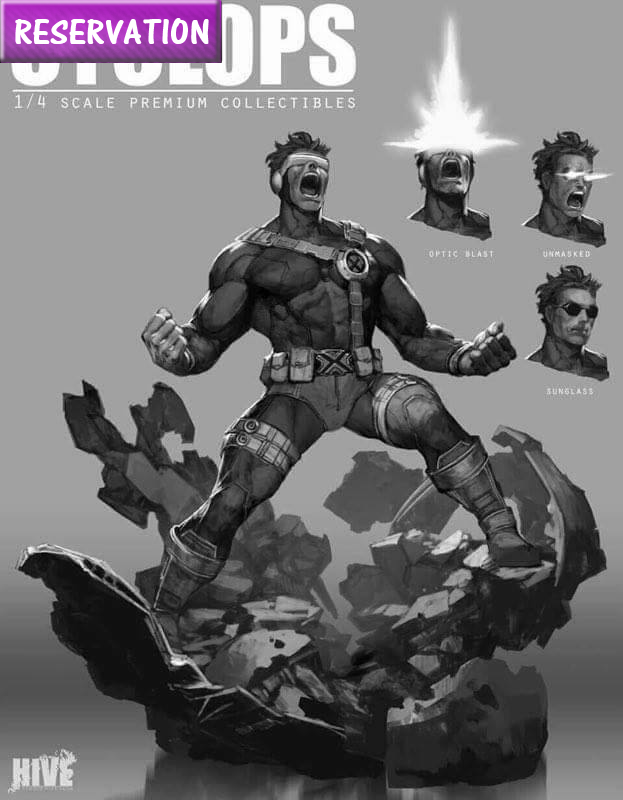 We wanna hear from you collectors, which characters are you looking forward to? 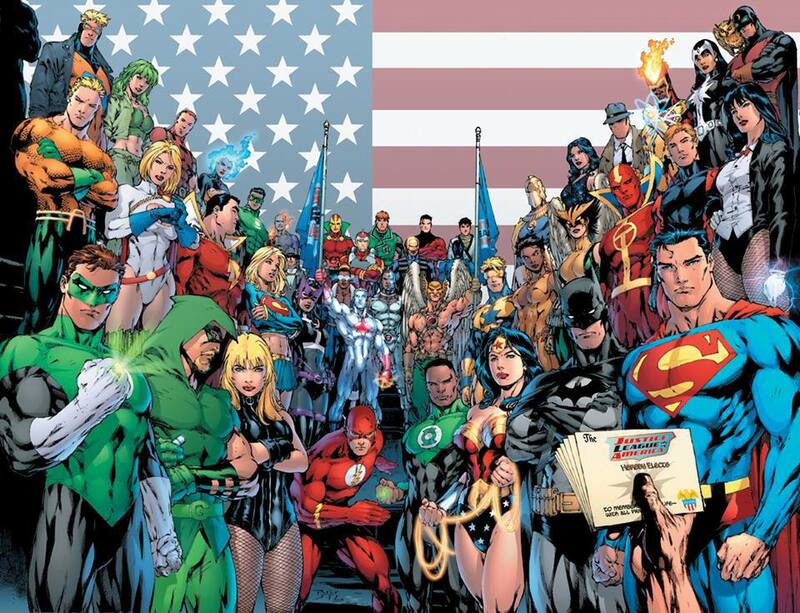 Classic or Rebirth costumes (or both?!)" 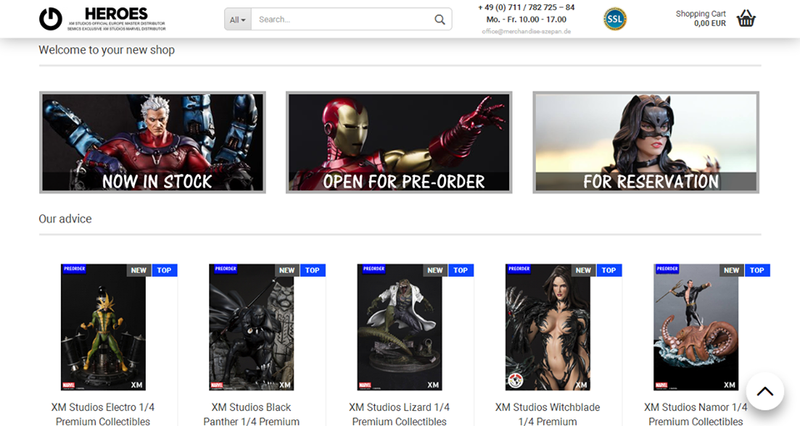 we want to say a big thank you to you for the first exciting days with our new www.xmstudios.shop homepage. We were overwhelmed by the positive response and the messages. At the same time, we received suggestions that we immediately implemented and would like to introduce short in this news. In terms of FAQ, Deposit and Reservation of articles we updated our FAQ and more. Of course in english and german. 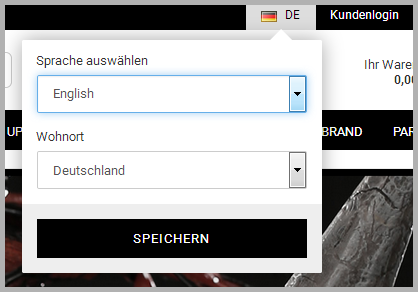 We supply the entire EU and have therefore created the website in English and German. 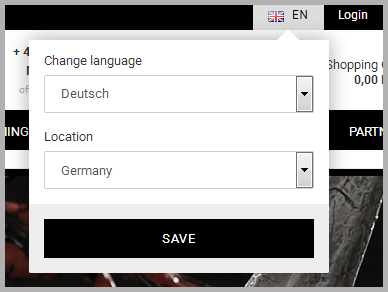 You can easily change the language of your choice at the top of the site next to the Login. Please take a look at the screenshots, it was there from the start. 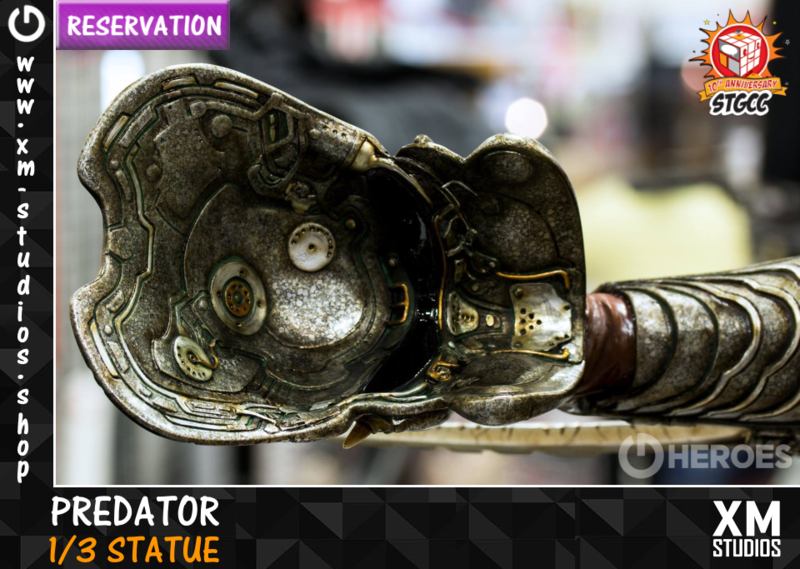 We have the new point "What means the Deposit of an item?" in our FAQ. 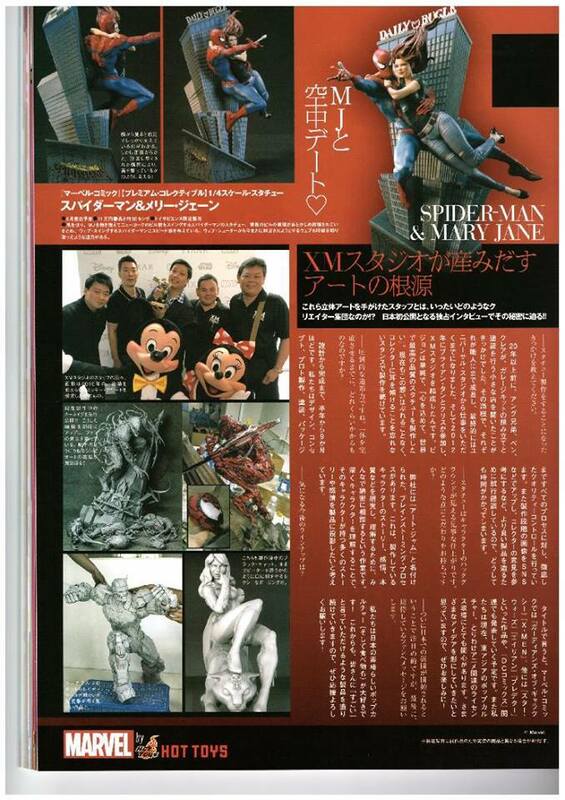 At the same time you can find the explanation from the same text in every article which is open for Pre-Order. We cleared many points on this new feature on our page. Under "What means the reservation of an article?" and "Is a reservation a pay with order?" you can find the answer in our FAQ. As for the Deposit you can find the explanation from the same text in every article under the point Reservation. We hope the new information helps you. If you have still a question please write a comment or contact us under Office@merchandise-szepan.de. We are here for you! 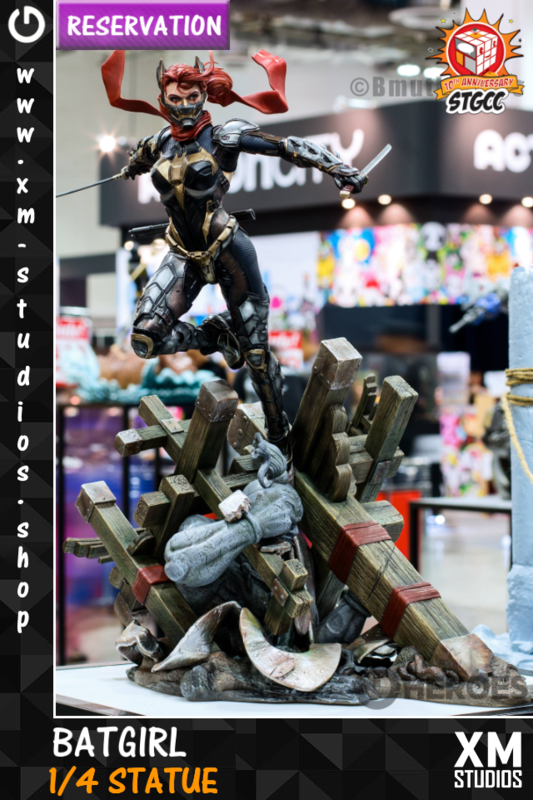 "See you in Singapore Toy, Game & Comic Convention - STGCC 2017"
today GHeroes is proud to announce our new partner for XM Studios statues in the Netherlands. 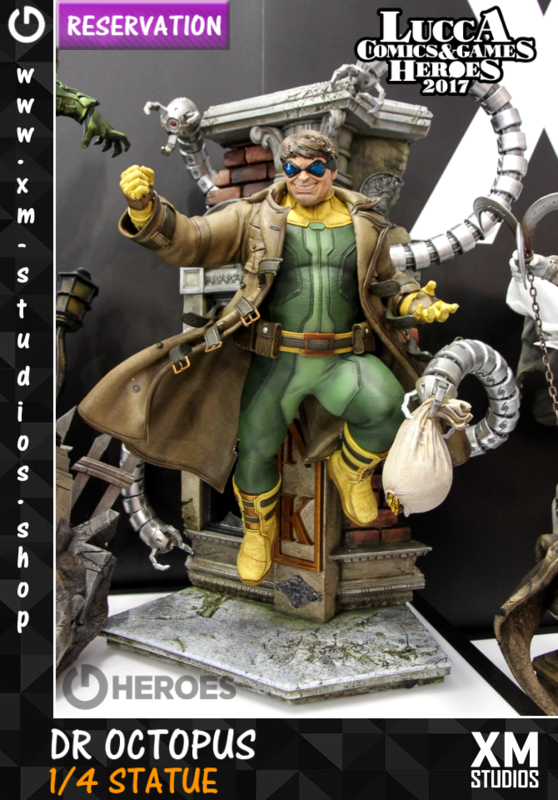 With more than 9 years in our hobby Metropolis Collectibles is one of the most respected stores in the Netherlands. 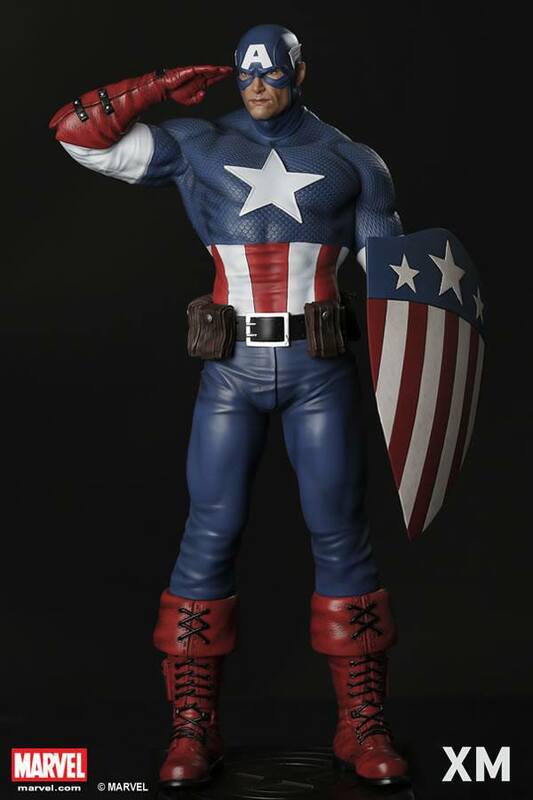 Find them on the homepage under www.metropolis-collectibles.com and let it be the address for all your movie, comic and game merchandise. We wish you all a nice week! 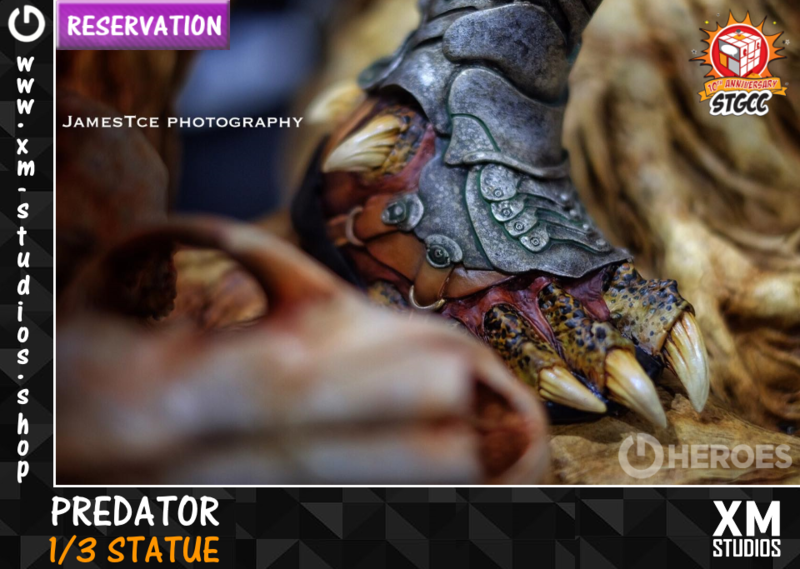 with the Singapore Toy, Game & Comic Convention - STGCC 2017 in front we open our statues for Reservation today. 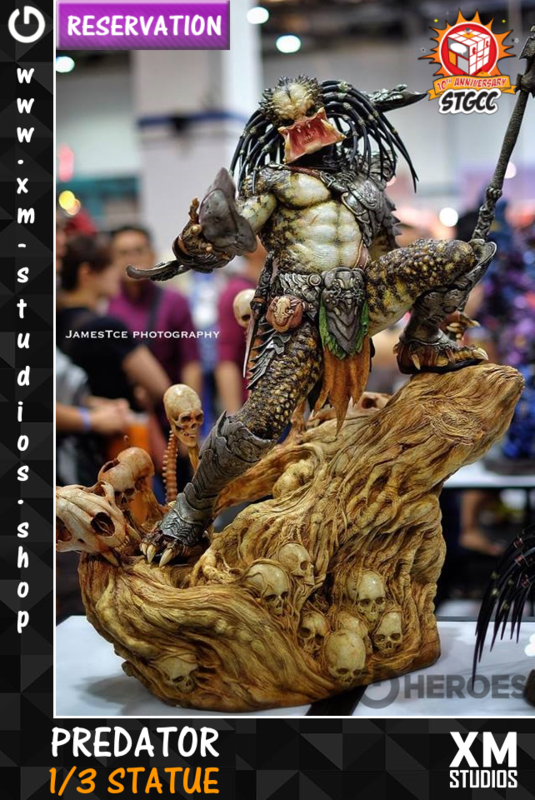 You can find our XM Studios Premium Collectibles statues in amazingly detailed 1/4 and 1/6 scale on our homepage www.xm-studios.shop. 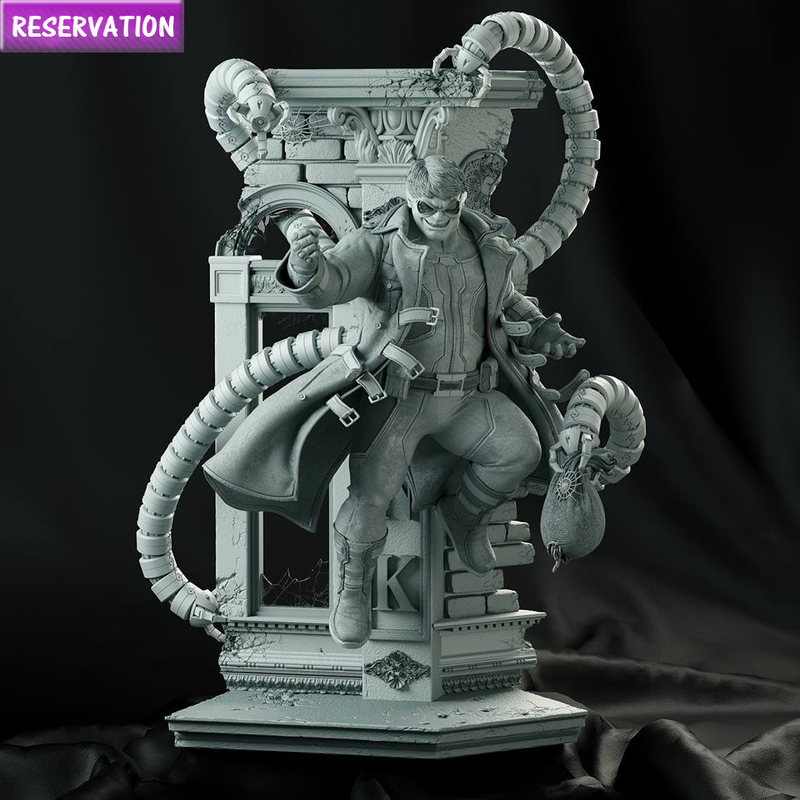 For information and where to order the Reservation we have included a description with links inside the news under the list of statues. If you have a question please write it in the comments. You can also contact us under: Office@merchandise-szepan.de. Thank you. 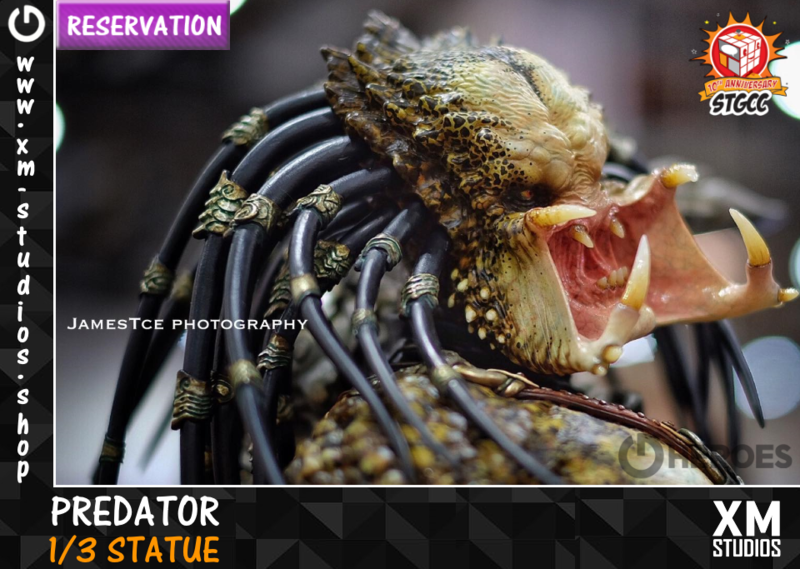 The following statues are open for Reservation. 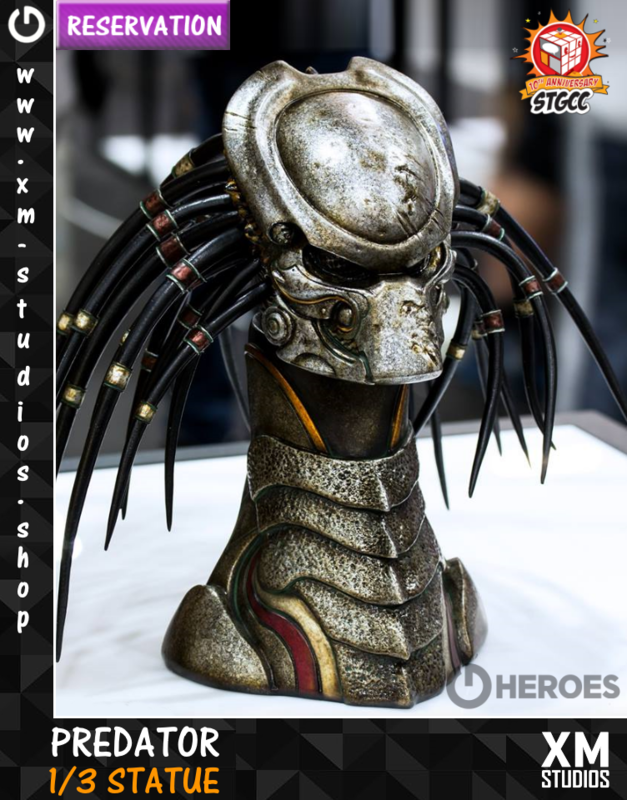 You can find them on our homepage www.xm-studios.shop under "XM Studios Now - Reservation" or you can also use the links for it. You can find the information in our FAQs under both links or directly inside the article. 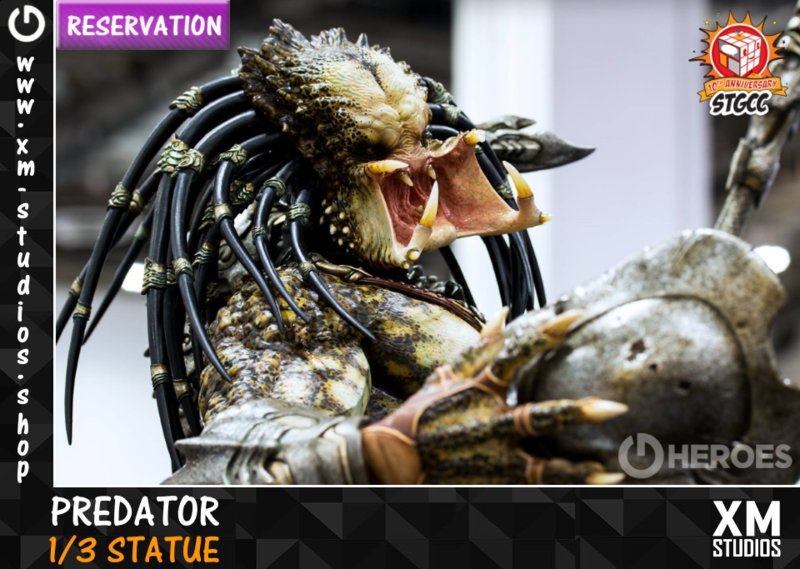 There is a tab over the description just with the answers for an Reservation. 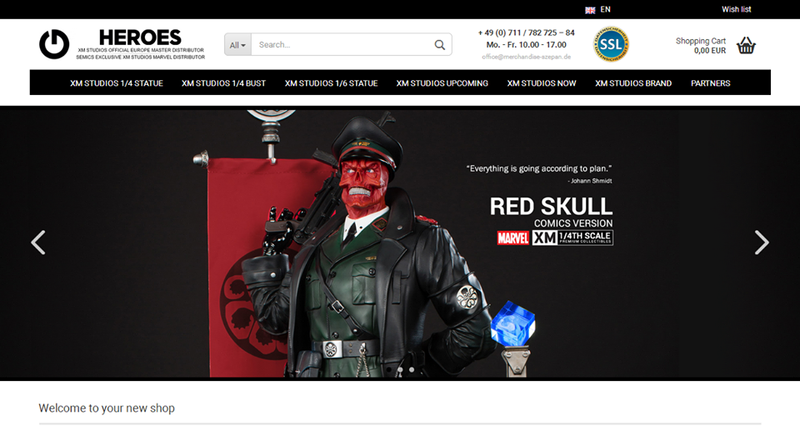 We will update our homepage www.xm-studios.shop with new pictures after we receive them from the coming STGCC 2017 next month. 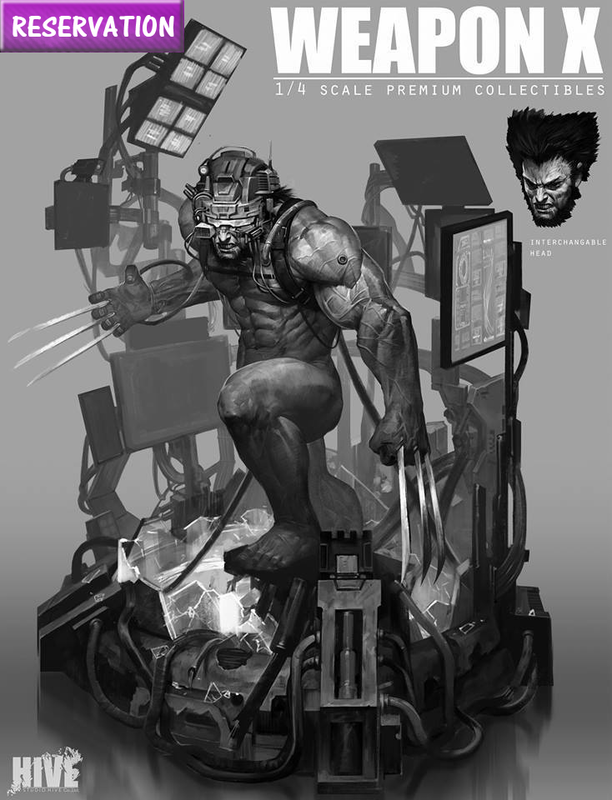 "Updates on the following products; 1:4 Rhino Statue, 1:4 Green Goblin, 1:4 Iron Spider-man, 1:6 Sentinel vs X-men Diorama Set. We want to reassure customers that these products are confirmed to be released. Certain delays are due to re-designs, approvals, staggering of release dates etc but will all be released. Currently, the planned released schedules for these pieces are in 2018." 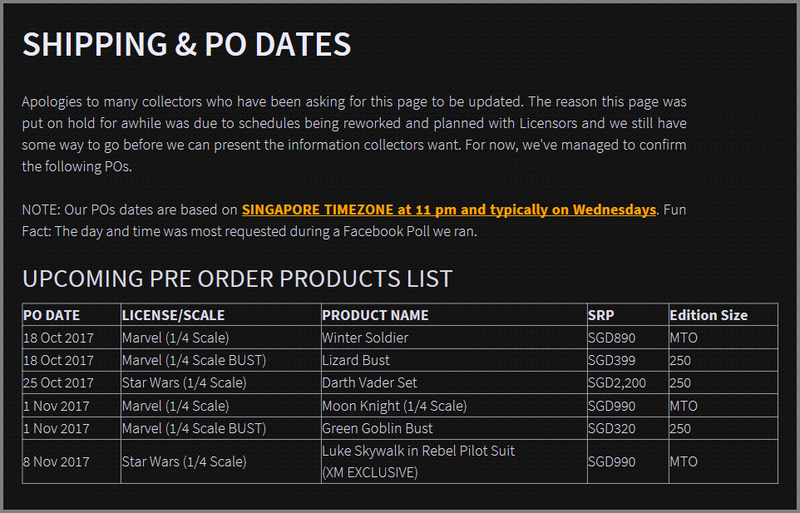 "Apologies to many collectors who have been asking for the PO page to be updated. The reason this page was put on hold for awhile was due to schedules being reworked and planned with Licensors and we still have some way to go before we can present the ideal information collectors want. For now, we've managed to confirm the following POs." 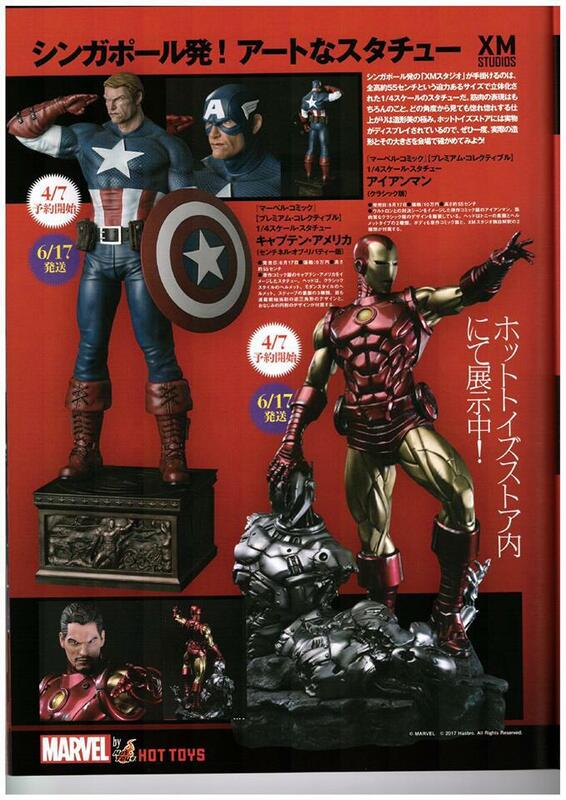 Guys, that´s an HOT ending year for XM collectors. 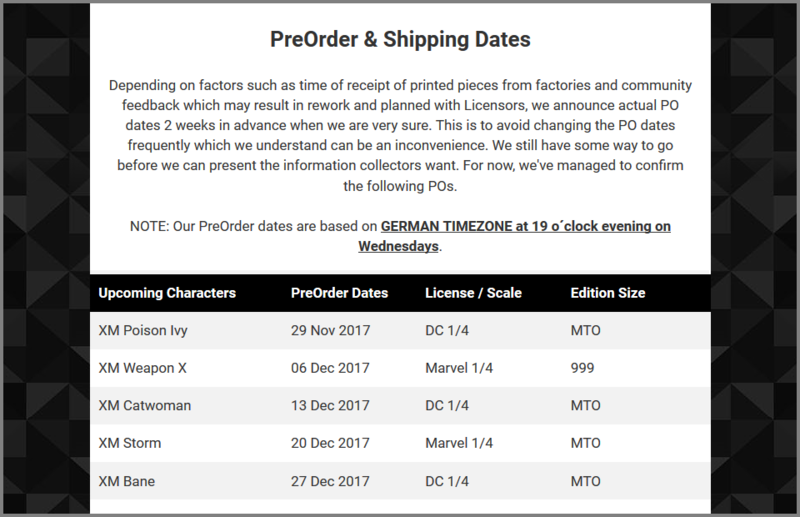 we have an update for our PreOrder list in europe. For now, we've managed to confirm the following new PreOrder dates on our homepage www.xm-studios.shop. If you have a question please contact us under: Office@merchandise-szepan.de. Thank you. You can find the complete list on our homepage www.xm-studios.shop under PreOrder & Shipping Dates. 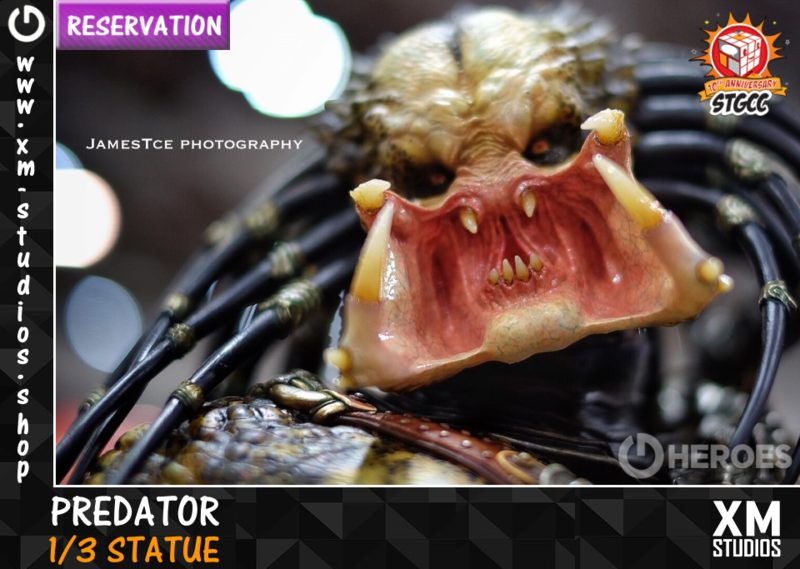 the words “What the hell are you?” are in our heads as we saw the Predator together with Dutch for the first time. 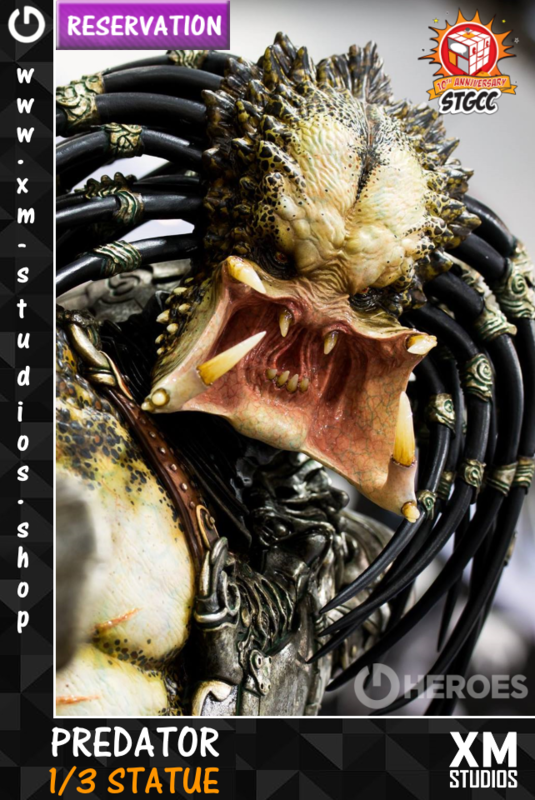 Since XM Studios showed the first pictures from the new XM Predator line by Narin we received so many questions with new words like “When the hell will he be available here in europe?”. 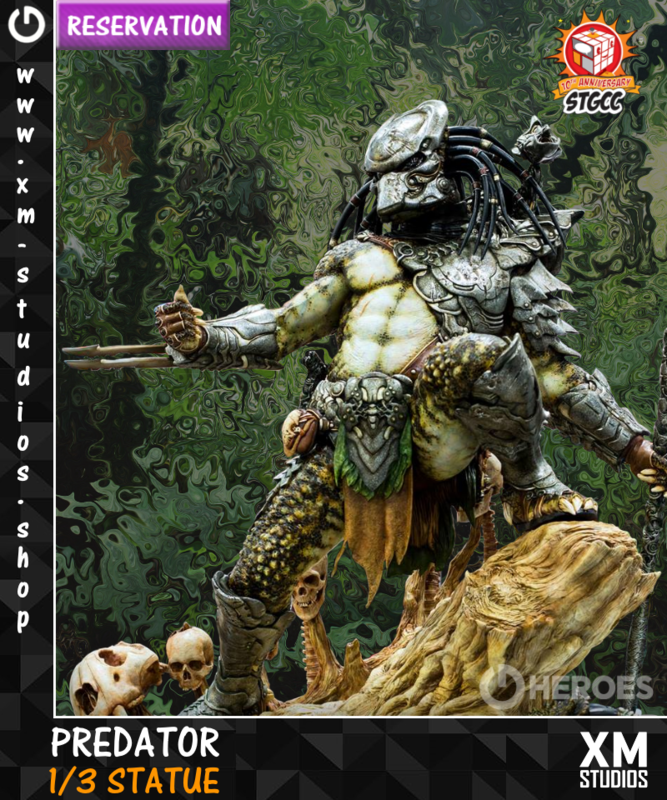 Today we are excited for our collectors and we are proud to announce that we acquired the distribution rights for the XM Predator Premium Collectibles here for us in europe. 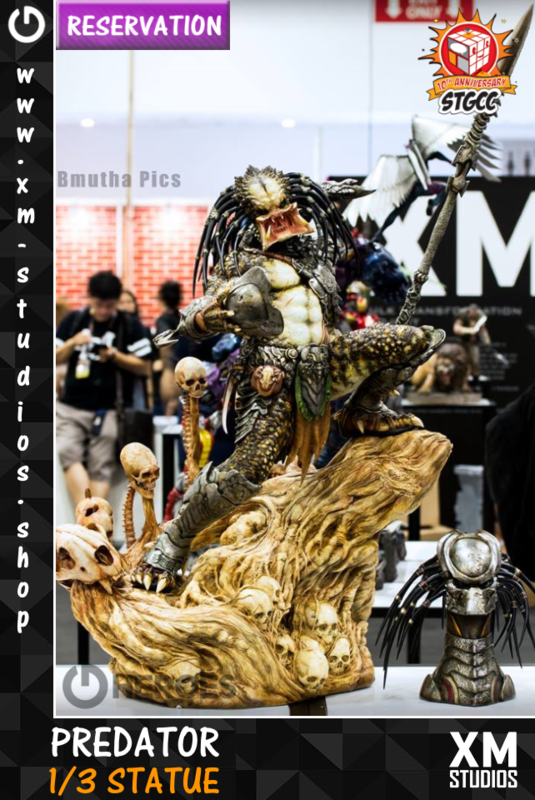 The first piece will be the showed XM Predator 1/3 statue and he is open for reservation on our homepage www.xm-studios.shop. 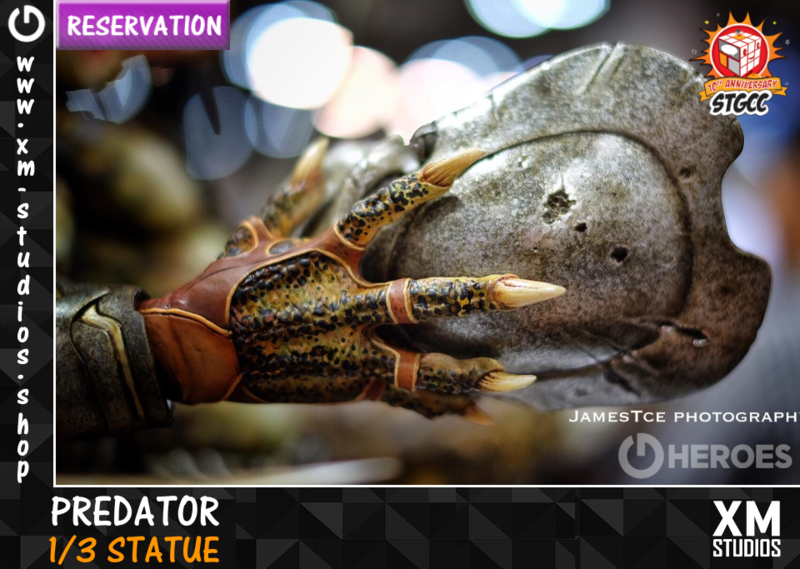 For our news we used the pictures from Kris Bales and James Tce from STGCC 2017. If you have a question please write it in the comments. You can also contact us under: Office@merchandise-szepan.de. Thank you. 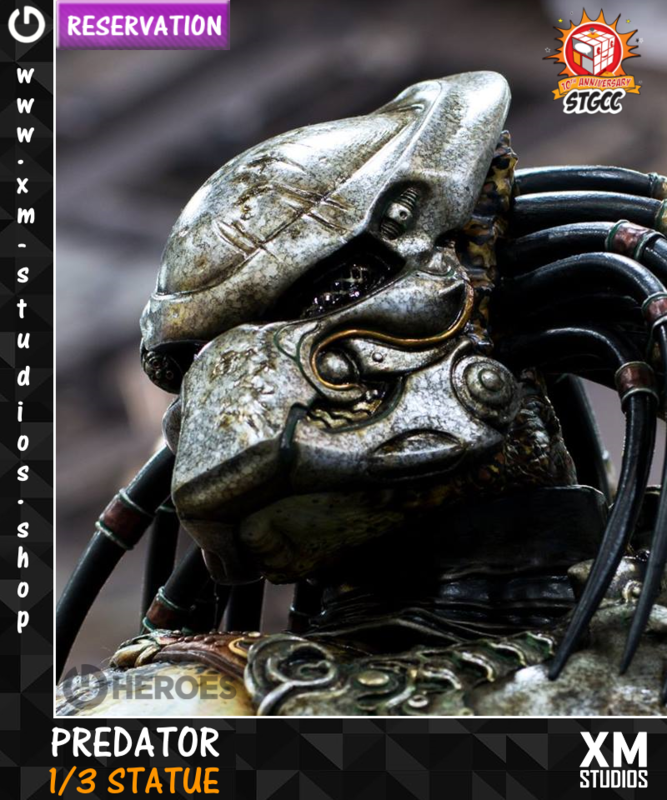 XM Predator 1/3 Premium Collectibles Statue. You can find the information in our FAQs under both links or directly inside the article. There is a tab over the description with the answers for an Reservation. Next event will be the Tokyo Comic Con 2017 at 1st December. Have a great start into the week and Get To The Choppa! 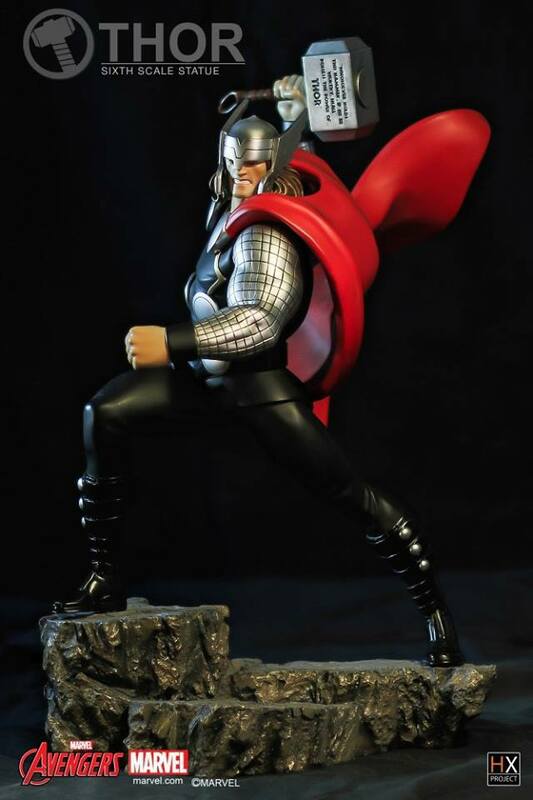 please note that the Pre Order List is paused momentarily as XM Studios Premium Collectibles rework some schedules. There will not be any POs this week until further notice. 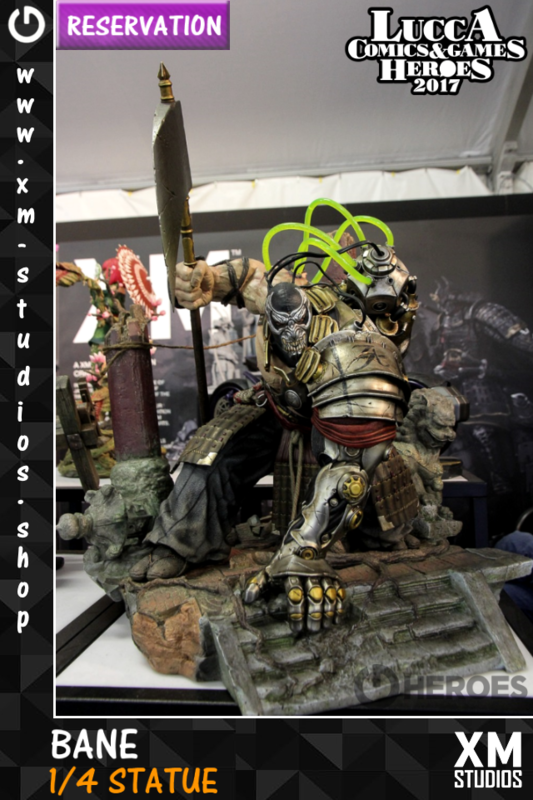 we promised to have always the newest pictures and after more events there is again an picture update for the Reservation statues on our homepage www.xm-studios.shop. Pictures are used from Kris Bales at STGCC 2017, itakon.it and Bryan Tan from Lucca Comics & Games 2017, thank you. For information and where to order the Reservation you can find links inside the news. If you have a question please write it in the comments. 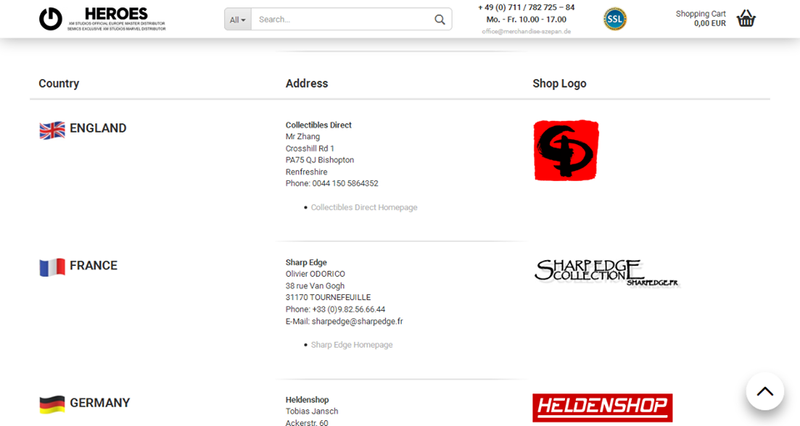 You can also contact us under: Office@merchandise-szepan.de. Thank you.